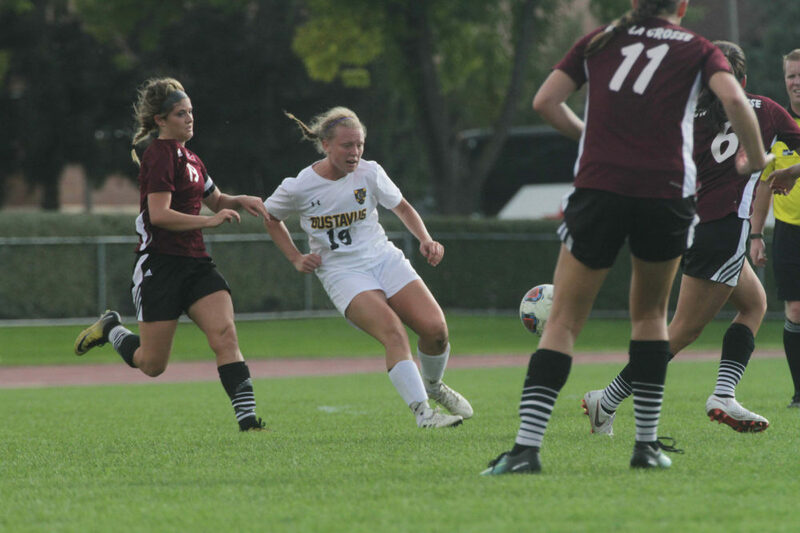 EAU CLAIRE, Wis. – The Gustavus women’s soccer team dropped a non-conference contest on Wednesday afternoon to UW-Eau Claire by a score of 3-1. The loss brings the Gusties record to 5-8-1 while the Blugolds are now 6-6-1. The Gusties jumped out to an early lead in the eighth minute when Chase Miller (Sr., Brooklyn Park, Minn.) found the back of the net to give the Gusties a 1-0 lead. The Blugolds struck back in the 35th minute when they evened the contest at 1-1. The game went into half 1-1 and in the second half Eau Claire came up with two big goals in the 60th and 62nd minute to take a 3-1 lead that they would hold on to for the victory. The Gusties were outshot 21-7 in the contest but the Blugolds had only seven shots on goal compared to Gustavus’ six. The six shots on goal from the Gusties came from six different players, with Katie Ashpole (So., Chaska, Minn.) being the only Gustie to have multiple shots with two. Leah Pavlish (Fy., Prior Lake, Minn.) got the start in net for the Gusties and made four saves while allowing the three goals. The Gusties will next be in action on Saturday when they travel to St. Catherine for 1 p.m. contest.